Ann Brelsford McCoy: Send in the Clowns. Anna B. received much of her formal training from her aunt, Carolyn Wyeth, where she learned the fundamentals of drawing. Carolyn who, despite her own unconventional work, insisted on countless hours of traditional exercises based on cubes, cones, spheres and the geometric underpinnings of all art since the Renaissance. McCoy recalls that Carolyn was “a tough critic.” The young artist-in-training recalls that she spent three years doing nothing but charcoal drawings, among the most demanding mediums since no corrections are possible and any misplaced stroke or accidental smudge means starting all over. In many ways this early training-the visual equivalent of practicing regular musical scales-is central to the freedom and spontaneity that is a hallmark of her present work. And, as every serious artist since Manet understands, knowing the rules and acknowledging tradition in order to break free of convention is the essence of a modem sensibility. Carolyn, who was herself trained by her father, N.C. Wyeth, also conveyed an earthy warmth, dramatic intensity, latent narrative content and even eccentric whimsy that are apparent in McCoy’s work in varying degrees to this day. McCoy attended the progressive Tower Hill School in Wilmington and spent a year at the Shipley School where she was among the students drafted to help with school art projects including the yearbook. At Bennett College she studied sculpture ‘I with Jean de Marco and Ralph della Volpe who introduced her to modem abstraction. In 1961 she enrolled at the Pennsylvania Academy of Art in Philadelphia but before her first class she met and married George (“Frolic”) , Weymouth at age twenty. As a young wife, and then mother, McCoy was unable to paint except during rare, stolen moments. In 1976 her marriage ended and McCoy determined to devote full-time to painting. 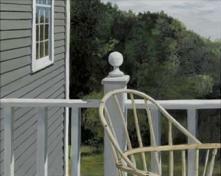 And while her cousin, Jamie Wyeth, once observed, “everybody in my family paints except the dogs,” Anna B. (as she is known to everyone since her childhood) has invented her own highly personal style that is distinctive and only superficially related to the work of other members of the illustrious 1 Wyeth family. Realism has as many definitions as there are artists who choose . to address commonly recognizable manifestations of nature and culture. If anything binds the extended Wyeth family of artists it is not their adherence to “realism.” It is, rather, their sense of tradition and history as a kind of palimpsest, an ever-present whisper informing the present, emanating from behind doors ajar and beyond the frame. Her parents, father John McCoy (1910-1989) and mother Ann Wyeth McCoy (b. 1915), undoubtedly played important roles in Anna B.’s decision to pursue art. She recalls a childhood love of English illustrator Arthur Rackham’s (1867 – 1939) work, especially the gnarled, anthropomorphic trees that populated such classics as Peter Pan in Kensington Garden and A Midsummer Night’s Dream. Rackham’s sinuous lines softened by delicate washes have faint echoes in many of McCoy’s floral and still life works, albeit without Rackham’s late Victorian horror vacui. John McCoy was a highly regarded painter whose work, especially mixed media works on paper, while clearly based on observed natural phenomena, pushed the edges of realism toward a kind of poetic abstraction. However, a more pervasive influence on Anna B.’s work, certainly in recent years, is found in the musical compositions of her mother, Ann. Her mother’s music derived from the classical European tradition filtered through American vernacular sources that also inspired the music of Charles lves and Aaron Copland. Aspects of Ann McCoy’s compositions-flowing melodic lines and soft dissonances, for example-have visual equivalents in Anna B.’s paintings, such as the slight asymmetry and gentle whimsy of a teddy bear and Raggedy Ann doll seated on an antique Windsor chair (Ann and Ted). It is tempting to think of this as an affectionate family portrait of herself and her husband, Patrick. Even in its fearless sentimentality it could not be more evocative of Anna B. The muted shadow of the chair against the wall is a soft chord against the dominant curves and diagonals of the chair. Painted passages meld into compositional unity in ways that are felt rather than seen. In fact, the artist believes that the paint, color and abstract elements of composition are far more important than the subject in the same way that a title for a piece of music is often only a guidepost to mood and emotional content.2 McCoy often listens to classical music when she paints, not as a source of inspiration but as a means to eliminate distractions and intrusions from the world outside her studio, and to empty her mind of conscious thought and associations with her subject. She paints directly with minimal under-drawing and the subject emerges from the paint rather than the reverse, the difference between a supremely confident and intuitive painting and a painting “about” a doll and stuffed animal in the hands of a less skilled artist. McCoy is equally adept in both watercolor and oil painting. The sublime with oils primarily reserved for “sculptural” subjects such as apples or other still-life objects where spatial complexity demands the build-up of forms and the tactile qualities of oil painting. Watercolor is often used to convey the more ephemeral aspects of nature-grasses and floral subjects-where the “reserve” of blank paper is as important I as the painted areas. Among McCoy’s most unusual and enigmatic paintings is Light as a Feather. The subject is an antique toy, probably late 19th century French. It contains a music box and when the toy is spun by twisting the wooden handle underneath, the dangling bells fly out to produce a kind of frenzied cacophony against the traditional melody of the hidden music box. The toy is placed in indeterminate space with feathers seeming to flutter around the figure-magically-in I the airless envelope of the mysterious setting. Sound, childhood memory, movement, and mystery coalesce in this strange, evocative painting. In her striking self-portrait, Masks, Anna B. presents herself as a clown, her face framed by tight curls that rhyme with her dog’s dense fur (an exotic, non-shedding Bouvier des Flandres). Halloween is something of a national holiday for the Wyeth family dating back to N.C. Wyeth’s elaborate celebrations when the entire family was required to disguise their identities, often , transforming themselves into characters from N.C.’s illustrations for Treasure Island, The Last of the Mohicans, Rip Van Winkle and other classics of fantasy and adventure. Outrageous costumes are less of a ritual than an obligation for members of the family, even today’.